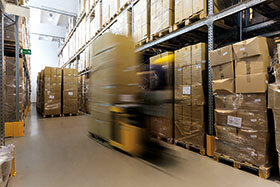 The UK logistics sector has enjoyed significant growth over recent years. The parcel delivery market in particular has had a huge boost as a result of increased consumer confidence in buying products online. However, competition is fierce with a regular stream of new, small local start-ups battling with household name delivery companies for market share. Efficiency and customer service have never been more important. In order to be able to quickly resolve any disputes over lost or damaged items, it is essential there is an audit trail which is supported by a visual record of a parcel’s every movement while being processed within a distribution centre. The challenge is even greater for international couriers who need to provide irrefutable proof that all parcels have been scanned before they are loaded onto an aeroplane. Failure to do so could have serious consequences with random checks by TAPA, potentially resulting in a facility being closed down. Working in partnership with one of the UK’s largest specialist security system installers, Tyco was invited by a leading international courier in 2011 to propose innovative ways in which the security of its distribution centres could be improved by the latest generation of video surveillance cameras and recording devices, and also how the same products could assist in the tracking of parcels. Since 2011, approximately 200 high definition IP cameras from Tyco have been installed at each of this client’s nine UK distribution centres. In addition to some of the cameras being located to assist security personnel to detect, monitor and capture evidence of any criminal activity for prosecution purposes, a high number of the cameras have been carefully positioned to provide video verification that every parcel has been scanned as it progresses in and out of a distribution centre. The cameras have been integrated with Exacq Enterprise video management software (VMS) and Kantech access control, both of which are Tyco brands. The integration between these three major component parts of the complete solution ensures the client is able to effortlessly visually verify in real time, and have rapid access to recorded video and data to provide proof that every item has been scanned. In this example, Kantech access control readers have been installed at the entrances and throughout the distribution centre to ensure there is strict control over who is able to gain entry to the building and sensitive internal areas. Additional card readers have been deployed to capture the ID of every parcel and this data is superimposed over the images captured by the cameras which are managed by the Exacq VMS. The images from all the installed cameras and scanned data are recorded and stored on ExacqVision multi-channel network video recorders (NVRs). Authorised personnel can access the live or recorded images and data locally or from a remote location, ensuring they are able to almost effortlessly and quickly respond to random checks. Since 2012, Tyco has been the single source provider of video surveillance solutions for this UK nationwide parcel delivery company. Approximately 100 sites have so far been equipped with high definition cameras and Exacq Enterprise VMS software to assist the client in fulfilling the mission-critical objective of scanning every parcel. As above, Exacq VMS was chosen because of its ability to efficiently manage and record the images of the high speed parcel conveyor belts carrying the parcels and also display the data captured by barcode scanners. In preparation for potential TAPA inspections, the images and scanned data are recorded and stored on the latest generation IP08-36T-2Z-2E Exacq servers and the client has also deployed Exacq Enterprise System Manager (ESM) to monitor the health of the video surveillance system across the estate. This is a long term ongoing project with the client’s preferred installation company and Tyco working in partnership to ensure maximum benefit is achieved from the images captured at each of the distribution centres and that new systems are installed on time and to the client’s complete satisfaction.